It was a big day of racing at Ocean Breeze, while only a select few were High Schoolers. The USATF Indoor National Champs have come to Staten Island, and are making their names known amongst the pro's. One such athlete was Matt Payamps (Saint Anthony's) who is currently undefeated against High School competition this winter. Payamps was entered in the 1000m, after snatching a qualifying time in his win at the VA Showcase. Entered in the largest field of the weekend, Payamps was slated for the final heat. Opening up the event was Robby Andrews, who currently holds the HS Record for the event at 2:22.28, and now runs professionally for Adidas. 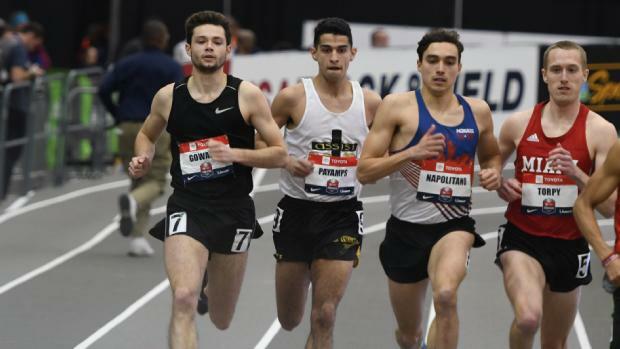 Among Payamps immediate competitors in his heat were former NY Prep Stars Ryan Manahan (Marcellus) and James Gowans (Mexico), who has the fame of being the first athlete under 4mins for the mile at the Ocean Breeze Facility. The race went out fast, and Payamps dropped to the back of the pack. He rode the pace through the first four laps, then made his move forward. Passing through, he was still accelerating out of the final turn. He would be caught behind the three-wide front pack, but would chase down that lead to a 5th place finish. Payamps ran to a 2:23.46 performance, good for US #2 All-Time in the event, behind only Andrews. He erases the previous New York State Record set by Miles Irish (Burnt Hills), set in 1983 at 2:24.1y. The mark stood as the oldest State Record not measured in yards. Payamps has committed to run at Georgetown next year, where Irish also ran Collegiately. "We went into this race with the idea of running fast," Head Coach Tim Dearie told MileSplit. "There was no set time in mind. It was understood that all Matt had to do was focus on being competitive and it would be fast. I was hoping he would be near the State 1000 record but he beat that pretty handily. He's in some rarified air with this performance and will ride that into the State and National meets."